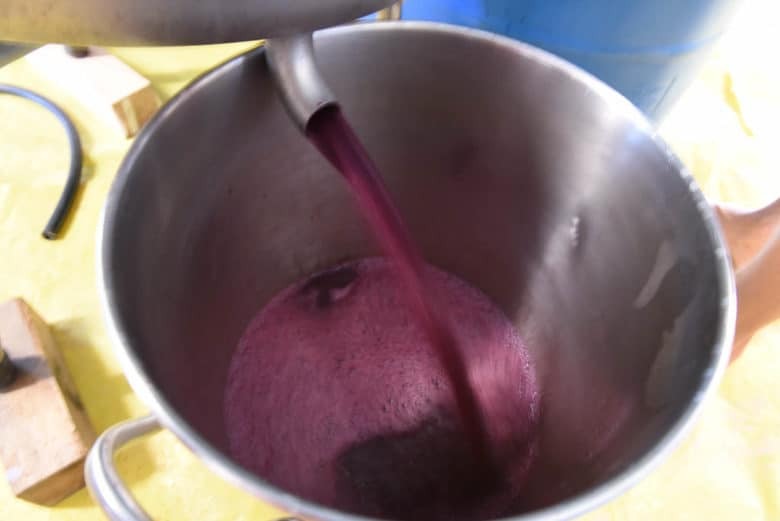 Making wine at home involves several steps and time. Making wine at home can be done with very little equipment. While we use a crusher/destemmer and a bladder press, it can be done without them. A quick internet search will yield a viariety of suggestions. 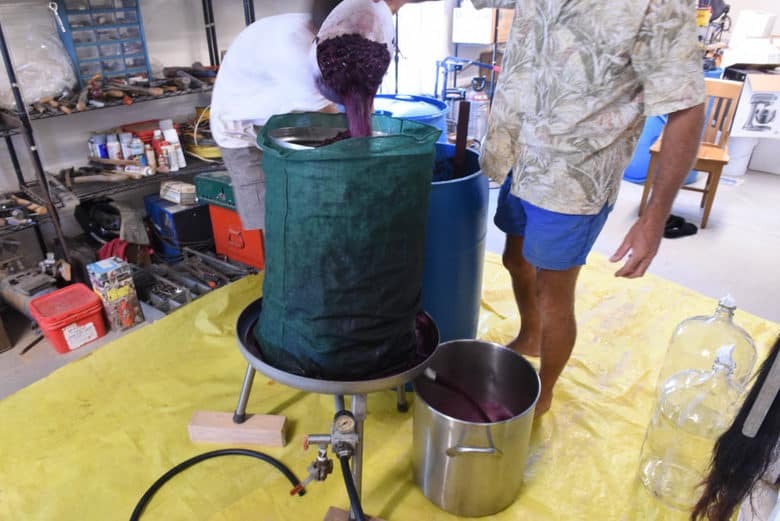 As you can see from the photo above, the grapes have been fermenting after crushing/destemming and it is now time for pressing to separate the wine from the skins. After crushing and destemming the grapes, they were put into a large drum with yeast to ferment. Each day, a wooden masher (for lack of a better word) was used to punch down the cap. The cap is the layer of skins that rise to the top. You can see the foam created when the cap is punched down. Now, it is time to press the grapes! Because of all the flies outside, we decided to do it in the work area of our basement. Below you see our bladder press. There is a bladder in the center which is inflated with water. To inflate the press of the bladder, a garden hose is hooked to the press and water is added until the desired pressure is reached. 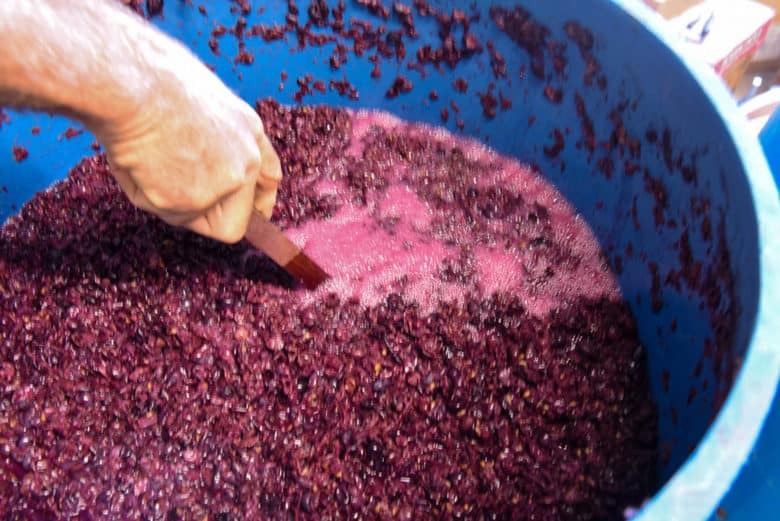 As the fermentation mash is poured in the top of the press, the pressure forces the grapes between the bladder and the side of the press and the juice runs out. I never get tired of seeing the dark color of the wine! 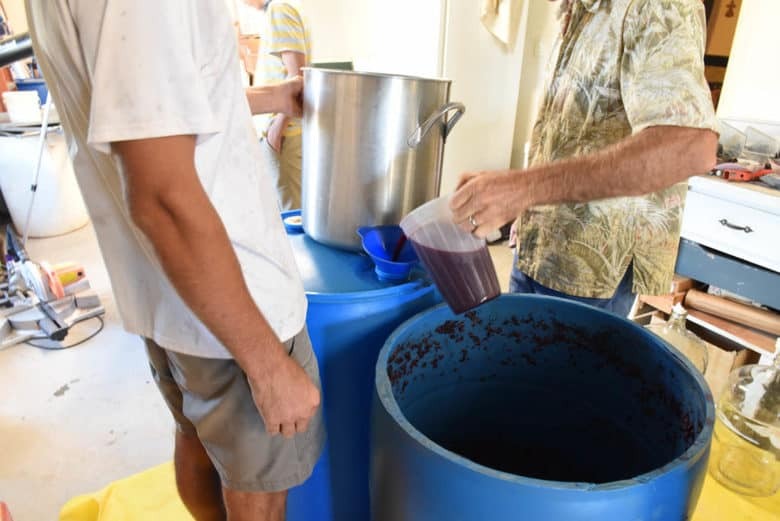 We catch the wine in a large pot as it comes out of the press and then pour it into 55 gallon drums. Below you can see the wine being poured through a funnel into the drum. And, just because I love the color of the wine and want to show you another view, here it is again! Isn’t it pretty? The wine will remain in the drums to settle. Any remaining sludge will settle to the bottom and we will rack it soon. To rack the wine means that we will siphon off the wine leaving the remaining sludge behind. 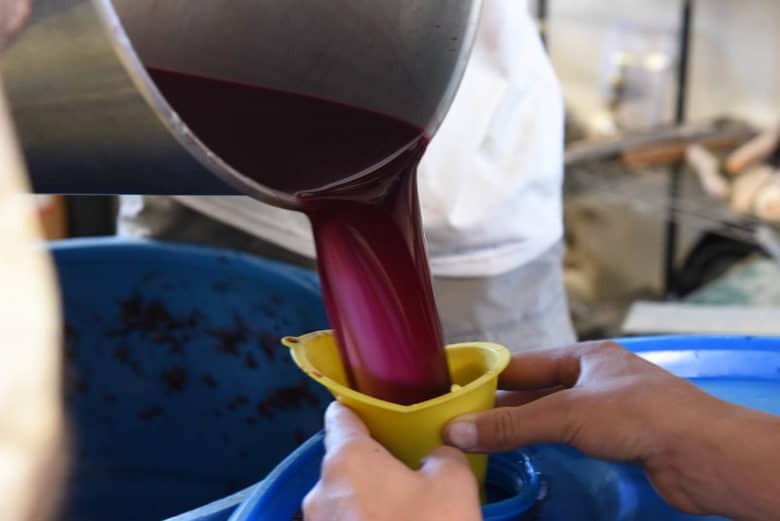 The sludge can cause a bitter taste so racking gives a smoother tasting wine.